GamesOnTrack A/S offers you entirely new experiences and more fun with your model railway. With unique voice control of model trains and layout, automatic data collection from the layout and automatic driving of more trains simultaneously makes it even funnier and more challenging to play in the miniature world of trains. We develop software which unites your model world with the experiences in the virtual world of PCs and Networks. In a simple and easy way you can make your dream layout function, drive a complicated mission or take part in tournaments with other train enthusiasts. The basis for you is Gamesontrack� Monitor - (GT-Monitor), which provides you a detailed description of your layout and what is going on there in an easy and simple way. By means of sharp time control you can monitor and focus on all details and at the same time gain an overview. Your core product is Gamesontrack� Command (GT-Command). This product combines PC-control and voice control with your existing digital controller. Using voice control you are free to call any train or any device on your layout irrespective of time and what is displayed on your screen and you can keep your eyes on the layout in stead of on displays and buttons. 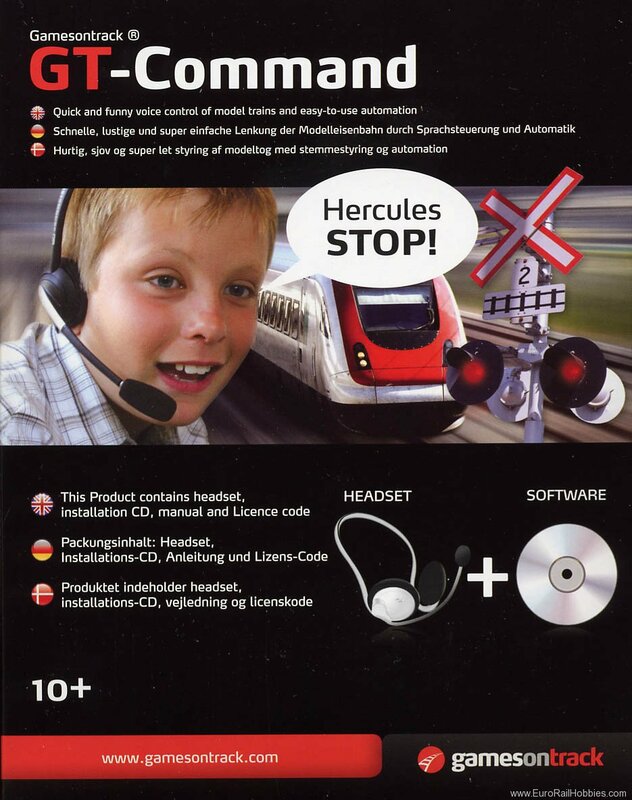 On top of GT-command is Gamesontrack� Automation (GT-Automation) an advanced way of getting many trains, sound, lights, and all kinds of accessories to move at the same time. Your layout can do more than what you currently can show. Use GT-Automation to create state-of-the-art experiences. Step by step more games and more interaction will be developed. If you have GT-Command, you have free access to the first 5 small single-user games. Over the summer we will launch our Gamesontrack� Games (GT-Games) with more powerful graphic tools and funny challenges for you and your layout. GamesOnTrack A/S develops software for model cars and model plains as well. In cell phones voice control has been an option for some time, however very few people use it. The problem is that you have to enter your commands and train the device in your language. Gamesontrack is different. We use already recorded libraries basing on 1000-4000 people from most parts of the country. By means of our intelligent command syntax and our own end point detector, we have optimized the voice recognition so that anybody having a clear speech can take the headset on and make the system obey: �Oldham forward two five� to make the train called Oldham move forward with 25 units or: �Oldham light on� to turn on the light. We have tried this in practice in many places and users as young as 10 years of age find it easy to make the system work almost immediately. It should be mentioned that we use a British English standard for English. During Christmas time a lot of playing has been going on using voice control and many different names for trains have been applied. Maybe �Oldham� is boring so why not use your daughter�s name �Victoria� instead. At least is it a bit more fun when she is around. Many children wish to try voice command and often they are very good at it! Only children being 5-6 years of age do not speak clearly enough to be recognized. However, we have heard that many women have discovered some new fun with voice control in the traditional male hobby. If you have any experience which we can learn from, please send us a mail so that we can help getting more fun out of it. Nothing can substitute a large red panic button. No speech can be formulated faster than what it takes to press the stop all button. The new M�rklin CS II controller has a big red button. GT-command has a panic button (F12), too, which stops all moving trains without discontinuing the power. In our opinion voice control will not substitute button control or pen control completely. It will still be there in the form of buttons, keyboard, mouse or the like. However, voice control is superior when it gets complicated. A bit of exercise is required to voice control your trains. Speech is connected with intelligence and brain activity. Face muscles must be moved in order to turn the command into activity. Most people say for approx. one second. That is more than it takes to press a button. As soon as we use intelligence to shift register, move trains to other buttons or to find other displays, we use far more than one second compared to only speaking the command. The Intellibox, the CS or the ECoS require our eyes, our intelligence and hands on the control buttons to make things happen. With voice control we train our memory and brain and in this way voice control is superior when complexity and pressure increases, but still we can keep our eyes on the layout. So far we have just opened the area of voice control. Much more is going to happen as the libraries and phonetic resolutions improve, PCs get more powerful, and we gain experience with command optimization. Let the system tell you what it already knows. There is no need for you to remember all addresses and hand code it. Gamesontrack can analyze your existing layout just by running on track and by activating the accessories. All that can be handled by the Automatic Learning feature in GT-Monitor. Let the system tell you what it already knows. There is no need for you to remember all addresses and hand code it. Gamesontrack can analyze your existing layout just by running on track and by activating the accessories. Let the system handle this with automatic learning. Automatic learning is a feature in Gamesontrack. Lean back, select �Monitor� in the menu �Game� and activate �Log activities� and �Automatic learning�. Drive your trains on the layout using your CS (60212)/ECoS/Intellibox/Twincenter/Roco 10785. Immediately, GT-monitor builds all trains, accessories, and blocks. You only have to deselect the ones that you do not want to be included in your layout description. Now you just need to decide on names (the grey fields) since all the addresses (the red fields) have been collected and the comment field contains what may already be described in the controller. You are now ready to monitor and command your model railway using voice control, and you are ready to automate. Most problems reported to us are dealing with the fact that it is difficult to remember and figure out what is already in the controller in terms of addresses and identifications irrespective of whether it is CS, and ECoS or Intellibox. It not because of bad controllers, it is just the simple fact that these devices are built for operation and do not have the power of the PC to manipulate, archive and find data. As your system grows, the simple administrative overview will be a steadily growing task to deal with. So let the system do it for you. This is why we have created automatic learning. All that it is about is to drive and play and this should not be difficult. There are many ways to do automation of a model railway layout. The traditional method deals with doing all the security stuff as a copy of the real railway. That means putting a lot of electronics under the tracks for how to adjust points, turnouts, occupation of blocks etc. Gamesontrack introduces a somewhat different method with focus on easiness and simplicity in order to get as much as possible to operate in a controlled way. There are many ways to automate a model railway layout. The traditional method deals with all the security stuff in a way quite similar to how real railways do it. A lot of electronics are mounted under the tracks to adjust points, turnouts, occupation of blocs etc. Gamesontrack introduces a somewhat different method focusing on easiness and simplicity in order that as much as possible is operated in a controlled way. Gamesontrack apply a simple scripting method to state commands and put them into a sequence. We add to this a multiple set of timers (pauses where you are just running), and a conditional structure where further operation depends on block occupation, points, turnout positions, speed directions, etc. Then we allow the users to build as many automation sequences as they wish, and let sequences call each other. This tool is exceptionally simple since it completely reflects the already introduced command language, with which you are familiar. We have seen both small and large layouts, up to 40 m2, being automated by means of this method. The good news for users is the cost savings on electronics such as braking modules, more read contacts, etc. These means can then be used for developing the layout instead. An even larger benefit is how quickly get ready to run and the many things you can do. The ability to script your thinking in terms of a set of standard commands and use simple block conditions are the advantages which most people find attractive. Please register your License key within 90 days of receipt of product. This will allow you free access to latest updates, questions and support. For Marklin users of the new Centrain Station 2, (60213) the folks at Gamesontrack are simply awaiting a protocal update for the interface ofn the 60213 and you will then be able to use this exciting game and tool. Stay tuned.